Wesco Liftkar Fold-L Battery Power Stair climber HandTruck (375 lb. Capacity Pneumatic Wheels) - Wesco 274151 is perfect for moving heavy loads upstairs has versatile L handle to assist loads while ascending the steps. The weight capacity ranging from 240 pounds to 375 pounds of Wesco Liftkar is actually a simple hand truck that can be turned into an electric stair climber with the addition of the snap-on battery. The Wesco Fold-L Handle unit is actually quite similar to the Fold Model Liftkar except for its shorter handle and the longer frame. With the wide, pneumatic wheels, this stair climber can be tough for outdoor use, even for rougher surfaces. The Wesco Fold-L Handle Model of the Battery Powered Light Duty Liftkars . It is similar to the FOLD Model Liftkar but has a longer frame and a shorter handle. It's suited for loads that require less tilt for proper balance than the Fold Model provides. motorized stair climber folding handleThis is the light duty SAL Liftkar that has a capacity from 240 to 375 pounds, depending on the model you choose. 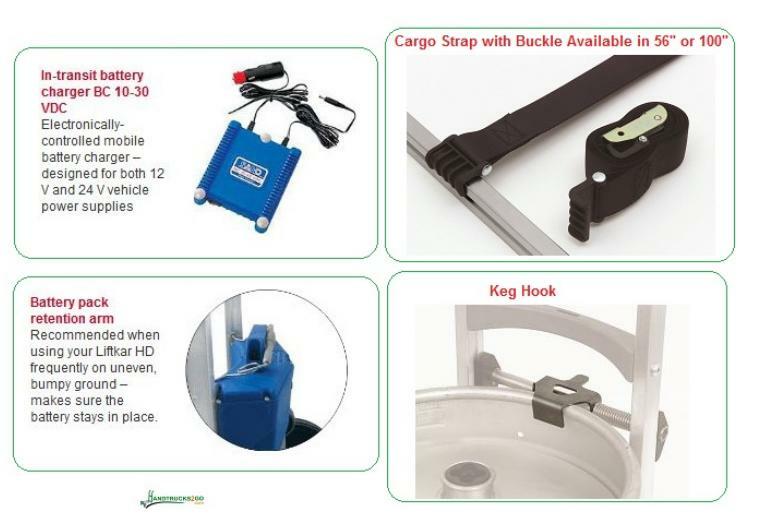 Perfect for those kegs of beer or for moving lighter appliances. Click here for the HD Liftkar that has a 725 lb. Capacity or here to see all of our electric hand trucks. Available with a choice of 7 nose plates and pneumatic or microcellular (flat free) tires. Scroll down below for images and to pick your options from the dropdown menu. Load Capacity : 375 lb. Dual-speed control allows the truck to fit your working environment. Quick-change 24 volt sealed maintenance-free battery pack and charger offer exceptional performance. Durable aluminum frame is designed for years of service. Ergonomically designed handle has a non-slip rubber coating for maximum comfort. Once you place the snap-on battery on your truck, your simple hand truck suddenly becomes a versatile battery powered stair climber. The motor makes going up and down stairs a pleasure. And thanks to the wide pneumatic or puncture-proof wheels. The LIFTKAR SAL is as manoeuvrable as any standard hand truck and can be used used outdoors on rougher surfaces as well. The powered Liftkar which is the most popular choice, as its 3 gripping points on the handle provide excellent balance for a variety of loads. The SAL Series climbing stairs has been reduced to the minimum: the LIFTKAR pulls itself up onto the step above and lifts to only the necessary step height. During descent the motor acts like a brake to bring the load down smoothly. It is also ideal for winding staircases and landings where space is restricted. A lubricated mechanical clutch provides the unit with optimum protection against impact to the support wheels. Additional electronic protection prevents damage due to overloading. While climbing, SAL hand trucks do not move any further than the height of each step. This makes high speeds possible at low power consumption. The extremely low weight of the truck itself is also a great advantage here. Without the quick-change battery unit the hand truck is only 6 kg heavier than a normal hand truck. 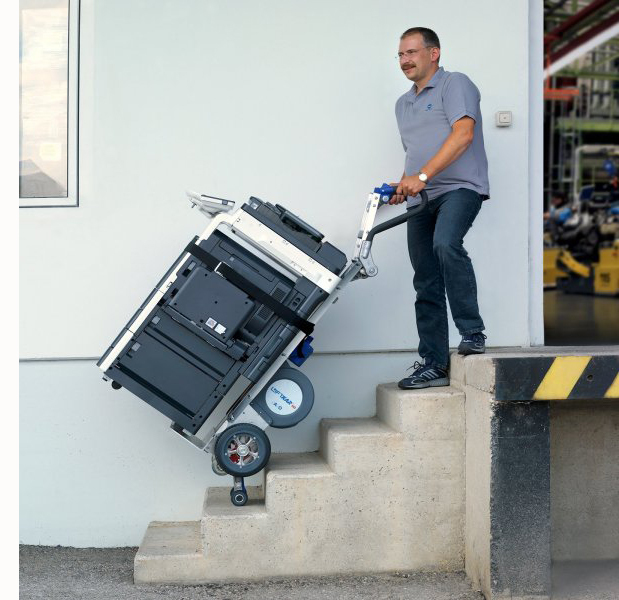 The LIFTKAR SAL is basically a conventional aluminium hand truck that is able to climb stairs without physical effort. The intelligent control system enables the load to be transported at two speeds at the touch of a button. An intelligent sensor system even allows the hand truck to find its own way down. You simply let the LIFTKAR SAL roll to the edge of the step. It then lowers itself smoothly onto the next step without you having to press anything. That means you can concentrate 100% on what you are doing. The LIFTKAR SAL is ideal for rapid delivery and transport, regardless of the application. Non-stop operation around the clock with a second battery unit and the in-transit charger (battery capacity is directly related to the load transported and the condition of the battery - average performance is 200 to 300 steps upwards, and at least twice as many downwards). Liftkar provides a guarantee of 1 year for on units, 6 months for frame components and 6 months for wear parts such as tires, battery units, toe plates, grips/handles etc. Customer is responsible for shipping costs to and from repair facility.